It has been two months since I have started working as a Market Promotion Intern for Organic World and Fair future (OWF). It is an eco-social for-profit company whose mission is to promote organic products and services while supporting fair trade in order to contribute to the social, environmental and economic sustainability of Nepal. A couple of days after arriving, we were taken on the tour of the city. The first thing that caught my attention was the heavy traffic. Immediately, I knew that my experiences over the next eight months would be shaped by Kathmandu’s massive urbanization. Early morning traffic in Kathmandu, Nepal. According to the Ministry of Urban Development, although the level of urbanization in Nepal is low, its growth rate is rapid and expected to remain so. 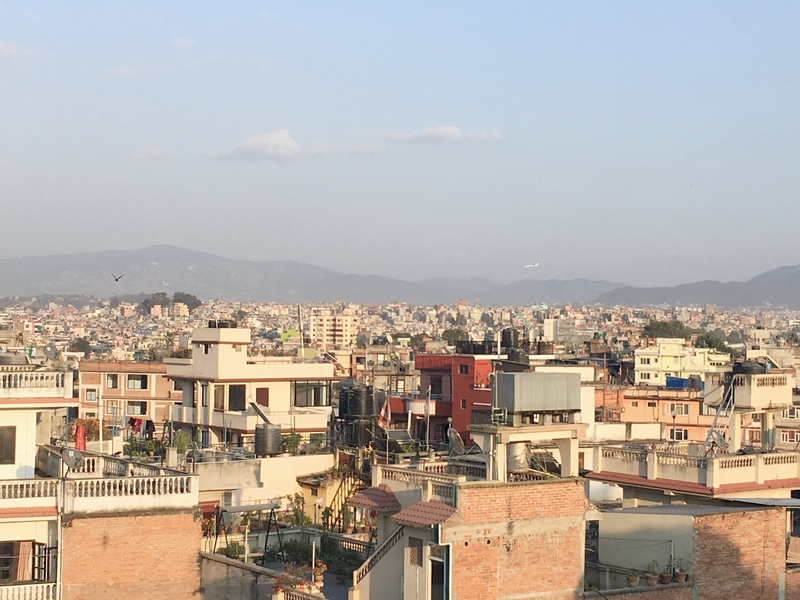 In Kathmandu, urbanization is the foundation of the city, which makes it a hub for all the beautiful culture, history, and economy of the country. It wasn’t until I returned from a trip to Pokhara during the Dashain festival, that I realized, many people were not actually from Kathmandu but had migrated to the city. Kathmandu during Dashain was very empty and quiet, which almost made me wonder if I was still in the same city. According to the tradition here, during Dashain, the biggest festival of the year, families all across Nepal get together in their villages. So, as told by one of the heads of CECI, around 2.5 million people just this year traveled out of the city for the festival! This is one explanation of how the city’s urbanization has been supported by the rapid growth in rural to urban migration. Urbanization is a critical development concern not only for the city but for the country. This poses the main question, why is the urban population in Kathmandu increasing faster than that of a city like Ottawa? My answer is that the recent influx of urbanization is due to locals moving from their hometowns in search for better opportunities, education, and facilities. When I asked my counterpart (who is not native to Kathmandu) what the difference between rural areas and the city is, she answered, the lack of infrastructure and services. Which means that due to this lack of infrastructure, resources, and facilities among rural areas, people are more likely to migrate to Kathmandu compared to Ottawa in Canada. 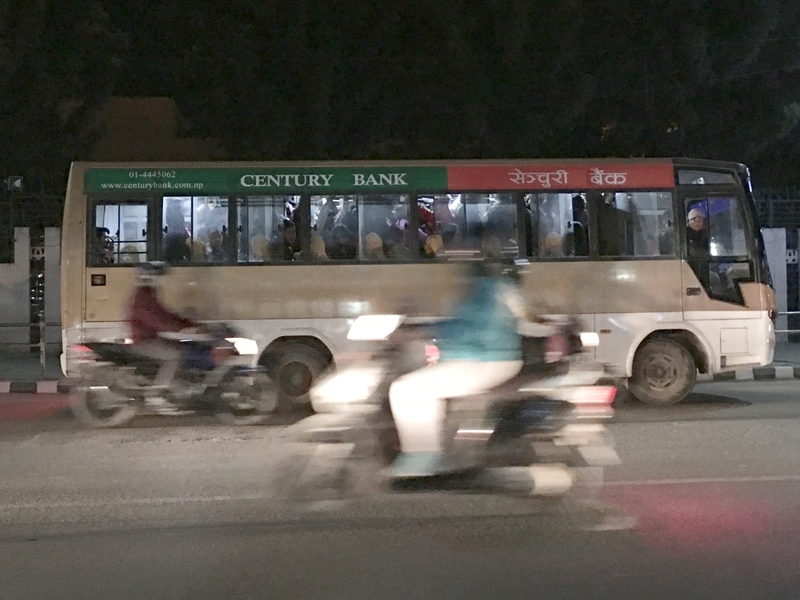 The Golden Bus at rush hour in Kathmandu, Nepal. With urbanization growing more than the city is prepared for, many challenges have emerged as a result. The major ones I’ve encountered are air pollution, water pollution, land pollution, the decline in agriculture, lack of labor in agriculture and food insecurity. 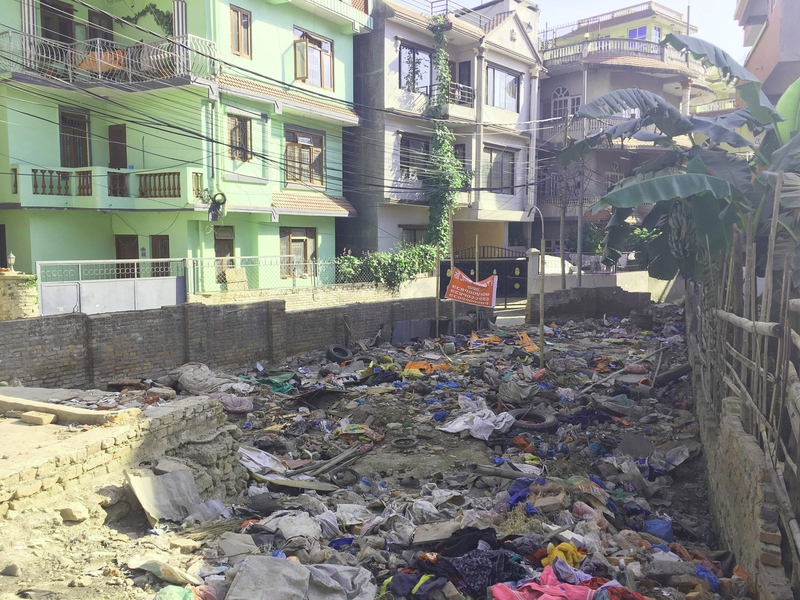 The state of land pollution on an empty plot in Kathmandu, Nepal. At first, I assumed women covering their hair and face was part of the culture; however, I came to know that it is worn to protect their hair, skin, and lungs from the city’s pollution. 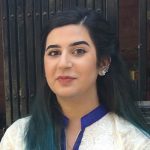 From my experience, supported by reports, the main reasons behind the city’s air pollution are vehicle exhaust fumes, industrialization, and waste burning. Though a similar problem, water pollution has a different cause- rivers being used for personal waste disposal. However, what I have realized here is that as quick as we are to point fingers at the government for these issues, we as citizens disregard our social responsibilities. We are the ones littering, openly burning waste, encroaching and disobeying laws. Yes, the government is also responsible, but we have to ask whether this pollution of our city is caused by the pollution in our minds. So, are our actions reflecting our ideal city? I asked a colleague, a highly educated and well-known member of the agricultural community, regarding urbanizations effect on agriculture. He replied that Kathmandu has seen a significant loss in fertile land because of the rapid urban growth. Not only does this mean that the agriculture sector is deteriorating, and people are moving away from the traditional agriculture occupations but also that the food supply in the city won’t be able to keep up with its growing food demand, resulting in food insecurity. This decrease adversely affects my organization, OWF, which is restrained by the lack of human labor. As a result, not only will it reduce our ability to produce enough to meet our production needs/demands, but also affect the quality and quantity of our products which would become susceptible to environmental degradation. Moreover, this can prove detrimental to our capacity to support fair trade, organic agriculture production, and organizational growth. The government did publicize the Land Use Policy, 2016, to prevent land fragmentation and unplanned urbanization by encouraging the practical use of land. However, due to the lack of related acts and regulations, the policy cannot operate. 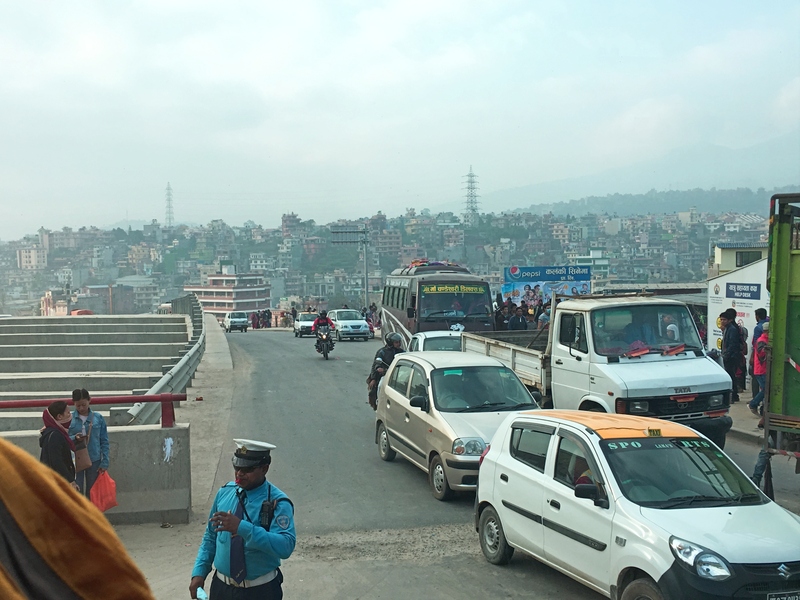 So, what lies ahead for Kathmandu’s urbanization? All in all, what I realized is that currently, urbanization might be one of the main development challenges in Kathmandu. However, I believe that with the right collaborative approach by the citizens and authorities, policy implementation and proper planning, it holds the potential to uplift the environment, and socioeconomics of agriculture in rural and urban Nepal! A view overlooking the urbanized Kathmandu, Nepal.